Your First Summer 2015 Naisbitt-Bagley Team Newsletter Has Arrived! Have you recently been asked, “How is the real estate market?” If so, this Utah monthly update has arrived to you in the nick of time to answer that question! Real estate sales are up and the market is great! 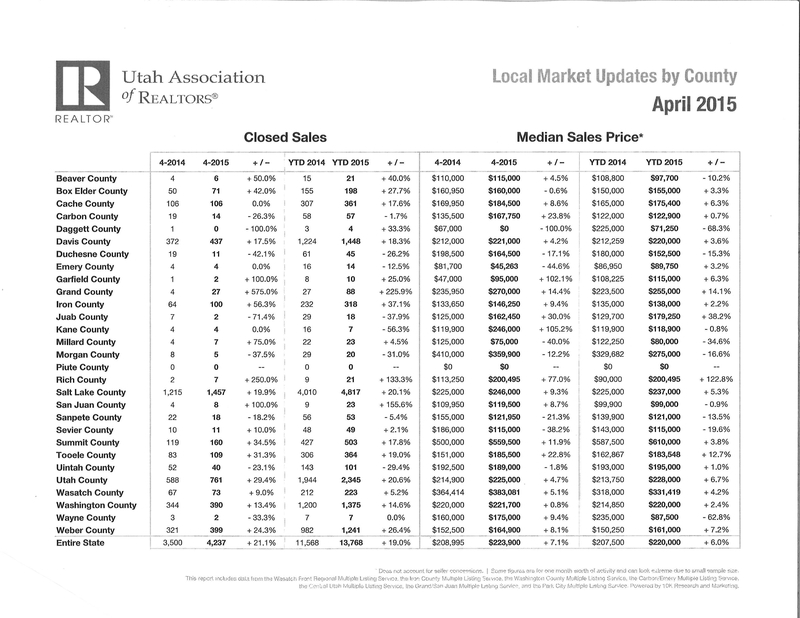 Attached please find the latest published April Utah Association of REALTORS (UAR) Local Market Updates By County. Closed sales for Iron County are up 37.1% year to date (YTD) this year as compared to 2014 at this time. Median sales price is up YTD 2.2% to $138,000 in 2015. Latest statistics for all counties in Utah are included in the report. From the National Association of Realtors publication by the Real Estate Buyer’s Agent Council Volume XX1V we quote, “With historically low inventory levels for resale homes in many markets, sellers clearly have the advantage.” I am not sure that all sellers have the advantage in our local Southern Utah market, but some definitely do as evidenced by the multiple offers that come in on some homes and properties and the rising median price and the higher number of closed sales. Remember there are videos, slide shows and pictures of your home online worldwide when you are listed with our Team, so having a home that is staged and picture-perfect is a must. Our aggressive advertising for you includes upgraded online advertising globally as well as all of the local advertising we do for you. Our homes and properties can be on on Iron County, Washington County, and Wasatch Front MLS sites. We try to have your home or property wherever a buyer or agent might look! The article also points out that some websites are interested In quantity rather than quality listings. That is why sometimes buyers find homes that sold days and sometimes years ago. That is true. We recently had a buyer find a home for sale that had sold six months ago. We also had a seller call and say he saw a site with erroneous information on his property. If that happens, please let us know which site so we can try to get the site that has it wrong to correct it. Sometimes they will but not always. We put it in the MLS, but other sites put the home on theirs too. The article states further that agents are able to search the MLS for sold properties and histories to help sellers and buyers know the correct market price. Please let our Team know if you would like us to use the information available to us on the MLS to do an individual market value for you to make sure your home and property are market-priced. We getting a few calls on development and commercial property and investors are back in the market. The top sellers are still resale homes under $200000 but all price ranges are attracting buyers. New construction homes are available too. Do you have questions or concerns? Please contact our Naisbitt-Bagley Team at 435-865-1019 at ERA Realty Center or email bagleyteam@gmail.com. Please also text or call our mobiles: Matt Bagley 435-590-8788; Janet Naisbitt 435-559-7772, and Jennifer Corral, 435-559-0366. When you buy or sell, we want to help you make all your realty goals turn into reality by letting our experience, training, and top service benefit you.